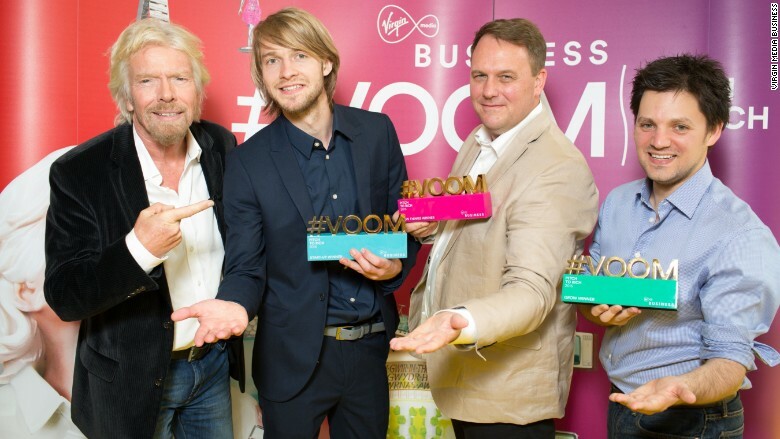 Richard Branson with winners - Kiryl Chykeyuk of Kino-Mo, Jeff Paterson of Fourex and Anthony Eskinazi of JustPark --who will share the £1 million prize. The three businesses that emerged as his favorite to share the £1 million prize ($1.6 million) in the "Pitch to Rich" competition include a 3D graphics maker, a money exchange kiosk maker, and an app that instantly connects drivers to parking spots. Kino-Mo, Fourex and JustPark on Friday were announced the winners of the 2015 Virgin Media Business "Pitch to Rich" contest in London. The three businesses, picked by a panel of judges that included Branson, beat out six other finalists to take home the grand prize. "Overcoming fear is the first step to success for entrepreneurs," said Branson in a statement. "The winners all exemplify that, and the hard work and commitment they have shown underlines what is needed to set up a business." The winners will receive marketing, PR and business development from Virgin Media Business for a year, and some mentoring opportunities from Branson. The contest, which is in its third year, culled the nine finalists from a total of 2,500 entrants and divided them into three groups: "Startup," for new business with huge potential; "New Things," for disruptive ideas that aren't yet established businesses; and "Grow," for existing businesses primed for rapid expansion. Kino-Mo (from the Startup category) has developed advertising and media technology to make holograms affordable. Its technology makes 3D graphics appear to float in mid-air. Fourex (from The "New Things" group) has an idea for self-service machines that exchange both coins and bills from almost any country in the world for pounds, euros or dollars. And JustPark (from the Grow category) has an app and website that connects drivers with more than 150,000 parking spaces that belong to property owners looking to make money from their unused spaces.